Looking for an e liquid that is going to remind you of your favorite berries that are packed with a ton of sweetness? Well, you should pay attention to this e liquid that is going to be flavorful and chilling. Blue Blizzard is the name of the e liquid that is going to have you salivating for days. 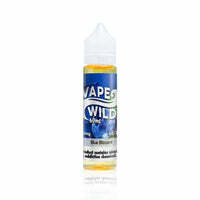 When you take a pull of this e liquid, you are going to appreciate the ripe blueberries that are going to be delicious. As you keep pulling, you are going to feel as if you are putting a handful of them in your mouth. However, there is going to be an icy sensation beginning to make its way in. You start to zip up your jacket because you are feeling a little cool. Although the temperature is going down, it seems as if it is not making you freeze up outside but inside you are icy. The throat hit is going to be smooth and perhaps unrecognizable, but there will still be one that makes you feel great! The flavors become more potent and your mouth might most likely begin watering if it was not watering before. When you think you are ready to exhale, you are going to let everything smoothly leave your system and the clouds you are going to make are going to be mesmerizing. The clouds are just going to get bigger and bigger, and crowd around you as you smell everything that they have to offer. It is just your regular cloudy friends paying you a little visit because they knew you would love the show that they put on. When they say goodbye, you are going to hang out and wonder how are you going to have the power to put this e liquid down because it is just too good to resist. There is plenty of it, so be ready to have a good time.